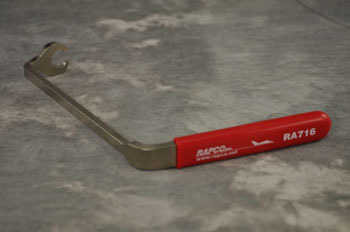 RAPCO has specially designed the RA716 Dry Air Pump Wrench to access the difficult to reach 7/16" mounting flange nuts on the dry air pumps of most general aviation aircraft. Proper uniform tightening of the mounting nuts is important in preventing oil from seeping out of the flange port and entering the pump. This quality tool is made of heat treated carbon steel for strength, and nickel plated for corrosion resistance. The handle has a molded grip for comfort.